How Does a Band-Aid Work? Air casts can be used to help immobilize injured areas such as ankles, wrists, knees and other areas where ligament damage may occur. They act much in the same manner as standard hard casts, with a few added advantages such as the ability to remove the casts in certain circumstances such as showering or for follow-up doctor appointments. 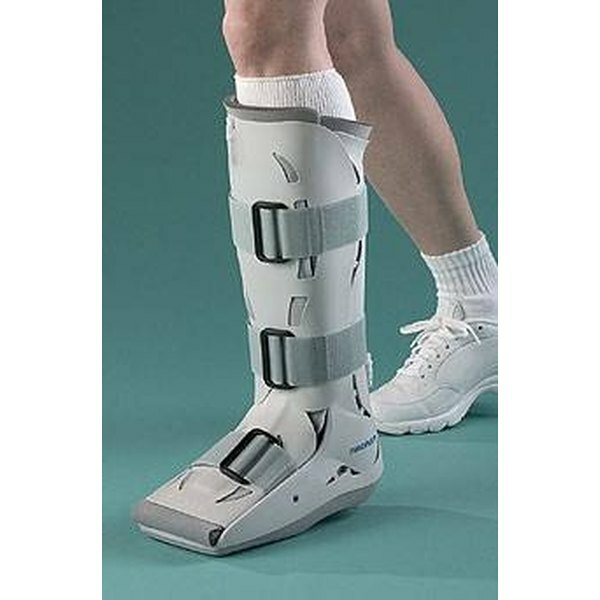 Typically, are casts are made of either hard or soft plastic materials. These materials are more flexible than standard hard casts, and they are used in conjunction with pads of air that are used to help protect the damage to the body. Two hard or soft plastic pieces are used to surround the injured area, and these pieces of plastic then have an inflatable air compartment placed inside of them. The cast is fitted around the injured area and typically held in place with Velcro straps, at which point the "air pads" are inflated until they are firmly holding the injury in place. If a foot cast is being used, a piece of hard plastic is also placed under the arch for added support.